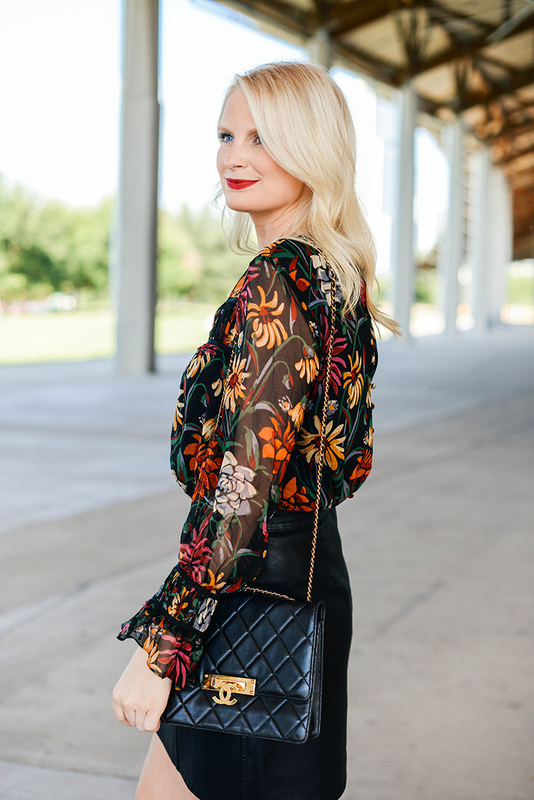 When I first spotted this gorgeous fall floral blouse, I was dying to take it with me to fashion week. I checked back the next week to order it, only to find it had sold out in every single size! Lucky for me, they restocked it a couple weeks later! 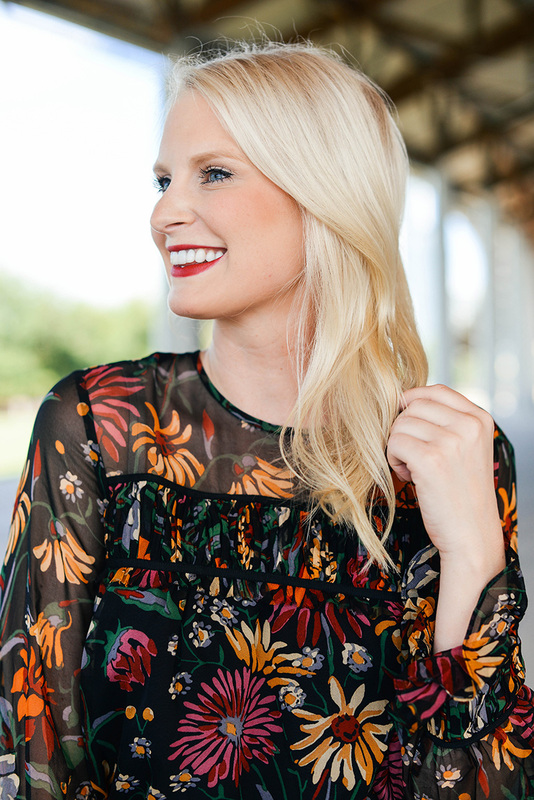 The colors on this cinq a sept blouse are absolutely breathtaking. 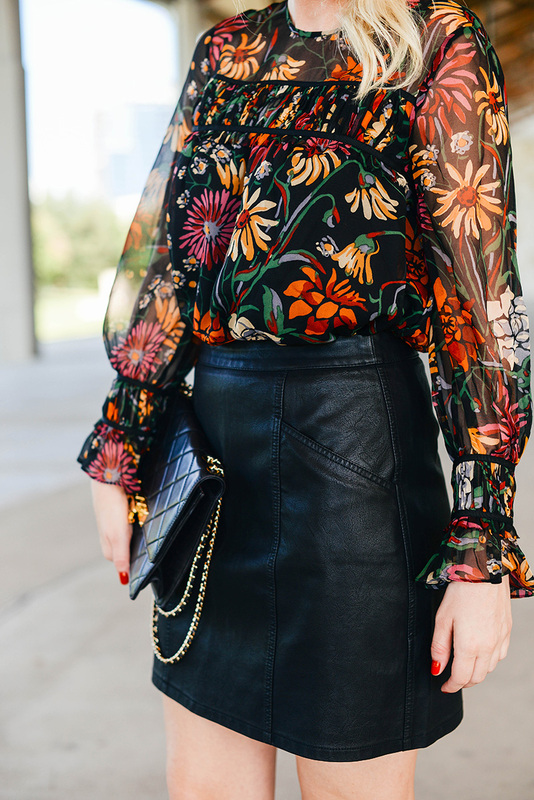 Every autumn color under the sun is featured on this blouse! It’s just the piece I need to get me excited about the season while it’s still too warm out to wear most of my fall wardrobe. If you love the style of the blouse, but prefer solids to prints, it also comes in solid black or solid white! This blouse looks gorgeous with flared denim (like these! ), black leather leggings and skirts of all silhouettes. It’s a beautiful option for the office too! I found this black skirt at New Look of all places – it’s got the look of leather without the hefty price tag. It’s actually under $30! This embellished cardigan is TOO CUTE! Would look adorable on the weekend with your favorite skinny jeans, or over a black dress or skirt at the office. Loving the Victorian-inspired buttons on this ruffled black dress. So perfect! If you’re looking for party dresses for the holidays or winter weddings, try this wine-hued metallic number, this tulle gown, or this luxe tassel-trim midi dress. The vintage look of this off-the-shoulder dress is totally timeless and chic. This blouse is the prettiest, this might be my favorite outfit ever! Oh what an amazing blouse!! Love how you styled it here too! Merritt, this might be one of my favorite outfits you’ve ever posted! Those shoes are TDF! 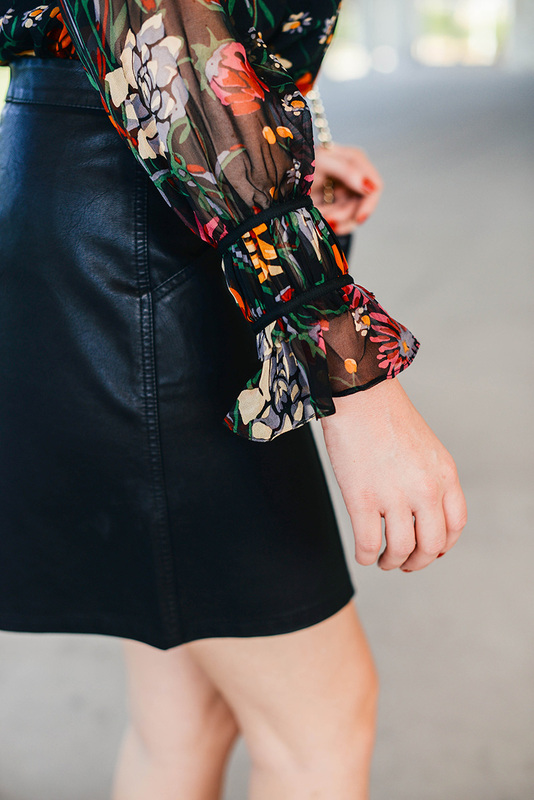 Such a gorg print on you, lady! Love it! Had to come over and check this out after falling in love with your IG post! One of my favorite looks of yours. Scheduled to pin! Obsessed with that top! Those colors are beautiful. I love how you paired it with that skirt! Your blouse is BEYOND words. Actually this entire outfit is basically what I’m wishing for this fall. This print is stunning! Love how you styled it! Merritt! This is absolutely stunning on you! That top looks so great on you! You look totally gorgeous! What a great top!